For your energy gels. Maybe also be used for travel, camping, or for toiletry items like shampoo and conditioner. 1.25 fl oz / 37ml. 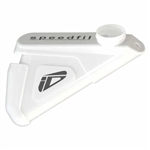 Replacement bottle for the Speedfill Hydration System. Perfect for mixing up your Perpetuem, Recoverite, and protein drinks. The Magic Ball Mixer wire whisk moves freely throughout the bottle as you shake it, mixing the thickest protein shakes, nutrition supplements, and more with ease. Perfect in the kitchen, at the office, at the gym, when you travel, or on the go. Includes 2 Hammer Pill Dispensers. This plastic tubes are about as simple as it gets for keeping your salt tablets dry and accessible. These fit comfortably in any jersey, race top or in your hand. The tube is clear so you will know exactly what is in there at all times. Easy flip top. Use these to carry your supplements or powder mix. Ridged, ergonomic design makes it easy to grab and go. Fits in all Standard bottle cages. Clear side gauge lets you see the amount of water inside. Cold or hot, this insulated water bottle keeps your drink just right! Best used with our tasty Hammer Gel. BPA free. Holds 5 oz. Holds 3 SaltStick capsules. Stick will last 1.5-3hr. Turn the front knob with one hand and out pops a capsule!